Lokomotiv Kuban Krasnodar used a 15-2 fourth-quarter run to take control en route to a 79-72 home win over Crvena Zvezda Telekom Belgrade on Friday. The win – Lokomotiv’s third in a row – lifted Coach Evgeny Pashutin’s team into sole possession of first place in Group D with a 5-1 record. Meanwhile Zvezda slipped to 2-4 with the loss. Derrick Brown paced the winners with 16 points, Marcus Williams tallied 13 points and 8 assists, Richard Hendrix also scored 13 and Krunoslav Simon netted 10. Marko Simonovic made 4 of 5 threes off the bench for 12 points for the visitors, Blake Schilb added 11 points and 6 assists and Charles Jenkins finished with 10 points in defeat. After a 0-11 first-quarter run put the visitors ahead, Lokomotiv’s terrific three-point shooting – 8 of 10 from downtown in the first half – gave the hosts a 39-35 halftime advantage. The lead went on to change hands 10 times in the second half until Mantas Kalnietis put Lokomotiv ahead for good with a layup midway through the fourth quarter that was part of a 15-2 game-winning charge. Brown drained an open three to start the scoring and then pulled up for a jumper and a 5-0 lead. 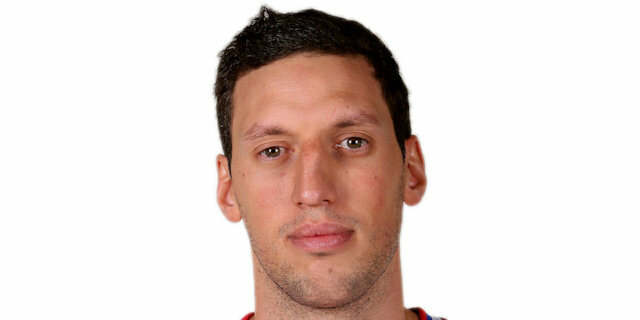 Brown showed his skills on the defensive end too when he blocked Boban Marjanovic. Schilb came up with a steal and made a perfect downcourt pass to Branko Lazic for an uncontested layup. DeMarcus Nelson added a jumper before Schilb gave the visitors a 5-6 lead with a long jumper. Luka Mitrovic took the ball away from Hendrix and Lazic drained a three in transition at the other end. Marjanovic capped a 0-11 Zvezda run. Simas Jasaitis sank a three from the corner to revive the Lokomotiv fans. 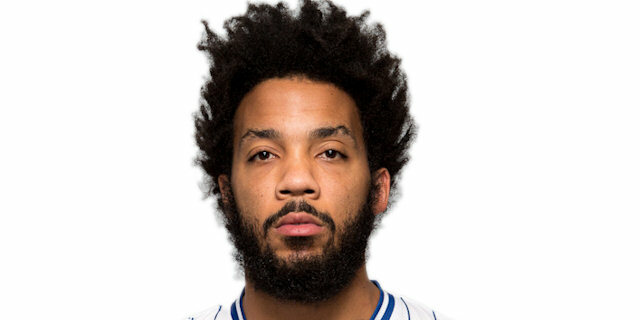 Marcus Williams pulled up for a three to tie the game at 13-13. After Rasko Katic scored for the visitors, Krunoslav Simon buried a triple to put the hosts in front. Ivan Radenovic came off the bench and scored twice for the visitors. A pair of Simon free throws kept the hosts close, 18-19, through 10 minutes. Valeriy Likhodey’s three put Lokomotiv back on top briefly before Katic muscled his way inside to tie the game at 21-21. Charles Jenkins sank a short jumper in the paint as the lead continued to sway. Williams made it 24-23 with a three, then Jenkins’s long jumper had Zvezda back in front. The game was knotted at 27-27 after Jasaitis’s second three, but Katic answered quickly with a bucket in the low post. Brown heated up with a pair of scores to give Lokomotiv a 2-point lead. Nelson shined with a basket – in which he switched hands mid-air – plus a foul. Brown countered with a three-point play. 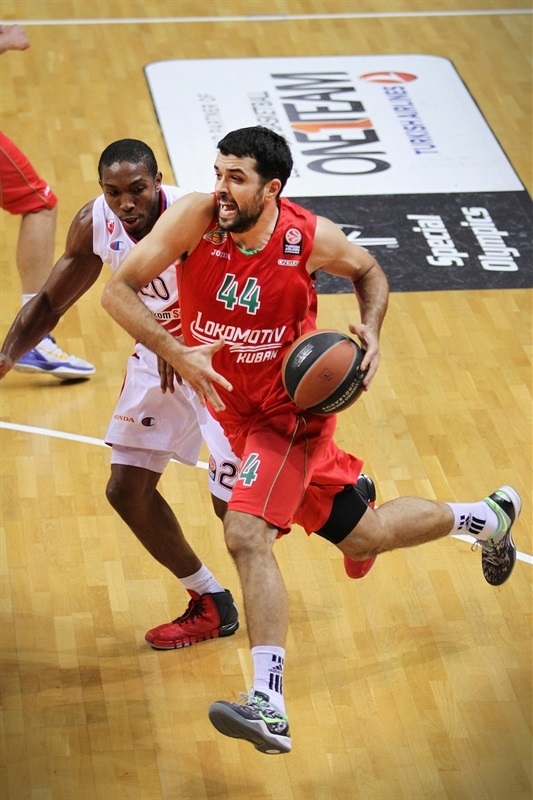 Jasaitis’s layup in transition put Lokomotiv up 5. Williams connected from deep to give the hosts their biggest lead yet, 39-31. Simonovic made a triple and Marjanovic scored from the line as Zvezda halved its deficit to 39-35 at the break. Jenkins picked up a loose ball and coasted for an uncontested layup for the first points in the second half. Brown scored in the lane at the other end. A Marjanovic follow-basket cut the gap to 2 before Likhodey countered with his second three of the game. 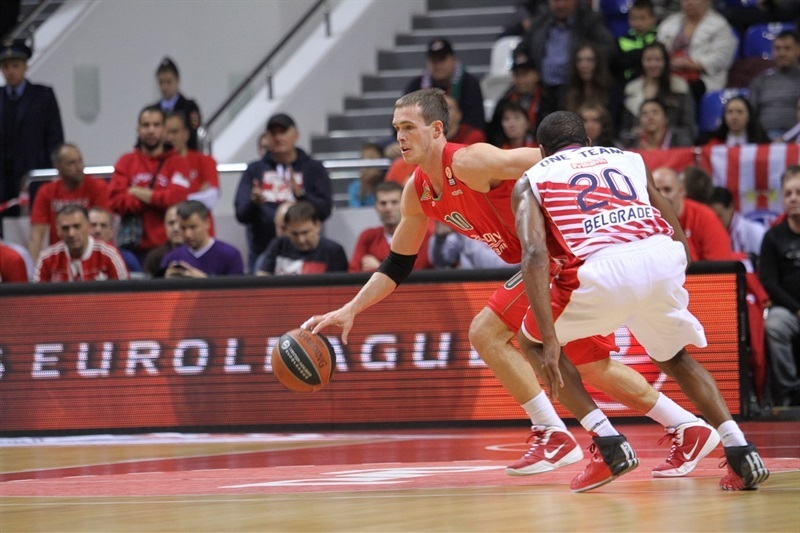 Schilb and Radenovic brought Zvezda within 44-43. Jenkins got to the line, from where he gave the visitors a narrow lead. Sergey Bykov fed Hendrix for a vicious two-handed slam – plus foul, however a Schilb triple made it 47-48. Brown scored on the ensuing possession but then Hendrix was called for his fourth foul. Mantas Kalnietis hit a big three and Hendrix scored from close range to make it 54-50. 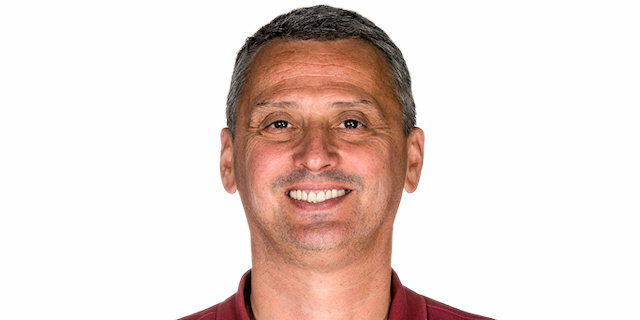 After Katic and Hendrix traded free throws, Simonovic connected from downtown. After Hendrix scored in the paint, Schilb drove the paint to make it 58-56 at the end of the quarter. Simonovic third three of the night – on a three-chance possession – gave Zvezda the lead, only until Hendrix scored for the hosts. When Hendrix took a rest, Simonovic drained another three to make it 60-62. Katic doubled Zvezda’s lead, but the crowd was singing again when Likhodey hit back with a triple. Maric split free throws to even the score at 64-64. 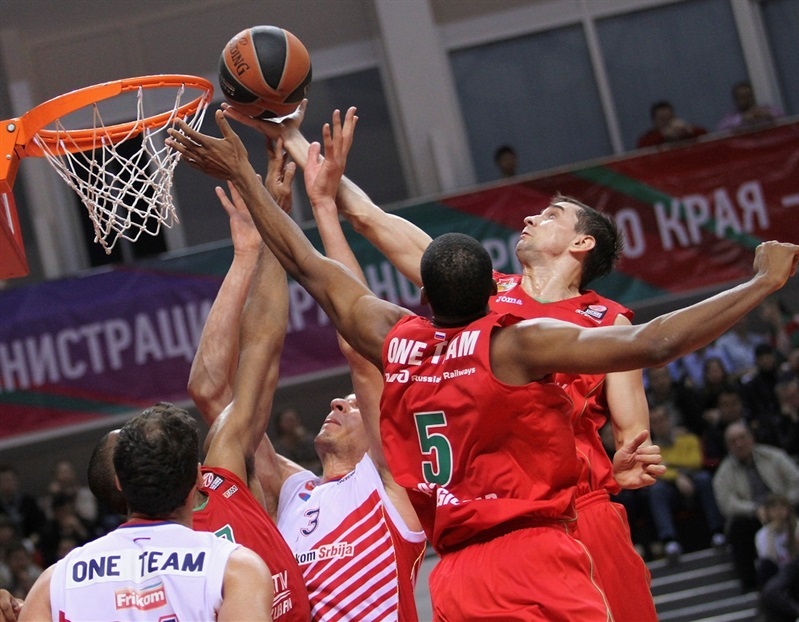 Simon blocked Jenkins, setting up a Kalnietis layup at the other end and a 2-point Lokomotiv lead. Kalnietis and Williams boosted the lead to 70-64 as the crowd erupted. Jenkins scored to keep Zvezda alive, but a Simon three put the hosts up 7 with just over three minutes remaining. Schilb lost the ball out of bounds with two minutes to go as time started to run out on Zvezda’s chances. Nelson missed a three, Jenkins fouled out and Williams gave the hosts their biggest lead from the line, 75-66, to close out a game-winning 15-2 charge. A pair of quick scores from Barjanovic and Jaka Blazic gave Zvezda a dose of hope – down 5 with 37 seconds remaining. But after a timeout Kalnietis attacked the basket and another Schilb turnover essentially secured the win for the home team. "This is a hugely important win for our Top 16 hopes. I can say that this victory is a big step forward for the whole club. My guys felt the significance of the game and came out very focused. Crvena Zvezda is playing really good now coming out of a four-game winning streak. But we managed to control their players - we stopped Schilb, limited Marjanovic and Blazic scored only 2 points. Our bench played great today - Mantas Kalnietis didn't practice for two weeks and still managed to control our offense on long stretches. The fact that we were shooting so good from three is especially delightful; that's our best shooting performance so far. One we've been waiting for a long time with such a good shooters that we have. We have a lot of tough away games ahead, and we're planning to play hard to maintain leadership in the group. " 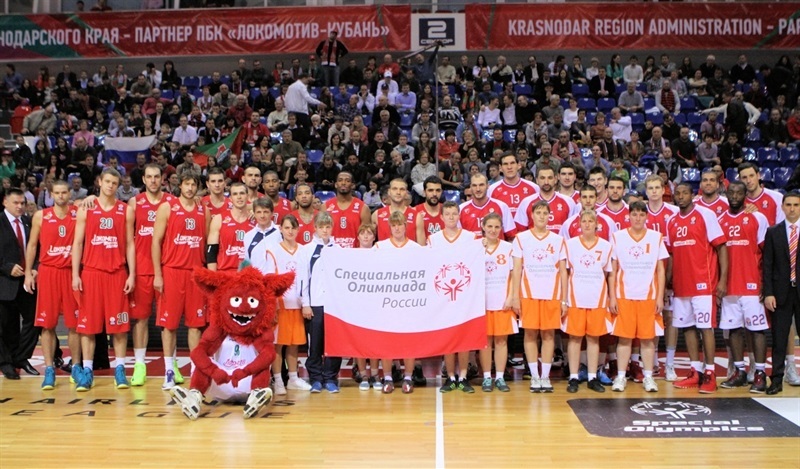 "Congratulations to Lokomotiv Kuban. When the opposing team shoots like this, it's really hard to win against them. And still we were able to stay in the game and take the lead at some points. I think that in the third and fourth quarter we played good defense, but couldn't make a run. And in the final minutes Lokomotiv just started to use our every mistake and turn them into points themselves. Our chances to advance after Laboral Kutxa's victory were slim and they are worse now, but we're still playing in the Euroleague and will fight in every game to honor our fans. " "Today we played great offense obviously. But at the beginning of the game our defense was not good enough to let us build the lead. In the second half we managed to play our usual level on defense and the way we stopped opposing players at the rim helped us get this win. As for me, I just play basketball and try to be as useful for the team as possible. If team needs me to shoot I’ll shoot, if team needs me to pass I will pass, when I'm on the bench I'm still cheering for the guys. " "That game was hard for both of teams. I think we played 35 good minutes, but couldn't keep up with the pace in the fourth quarter. Our conversion went bad in that period and such an experienced team as Lokomotiv Kuban used our mistakes."